how often do i post recipes in time for a holiday? so, i'm sharing with you all a recipe of something that you can make for this upcoming holiday- fourth of july! my family was never big on celebrating fourth of july, and as i type this, i can't remember what we used to do. i remember we bought a car one fourth of july, but knowing my family, we probably went shopping at the mall for all the sales or stayed at home to avoid all the crowds everywhere else. by the time i was in high school and college, my friends started hosting potlucks and barbecues, and those became my celebrations. these days i just look forward to having the day off work and hope that someone will host something so I can play with fireworks. whatever you plan to do this year, whether or not you're celebrating this day of independence, you can make this galette. a galette is a rustic version of a pie, aka lazy pie, because it involves no blind baking, no edge crimping, no trying to line a pie dish with dough. clearly, i am not a fan of making pies. it's much simpler to make than a normal pie, in my opinion, and i love the simplicity of it. 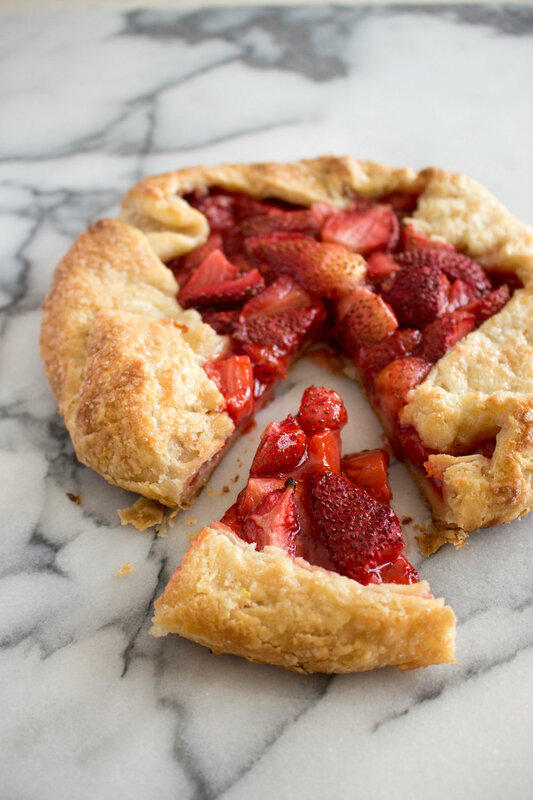 this galette is perfect for berry season this summer; mix and match the berries or make multiple galettes.! i love the crust here because there's a slight hint of lemon, which will pair well with whatever berry you decide to use. slice into wedges, serve warm with ice cream, and eat away! happy 4th and happy baking, readers! 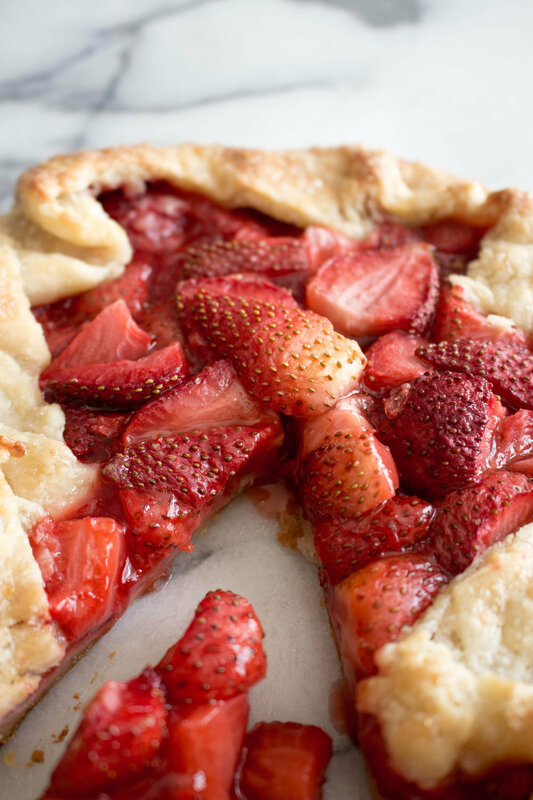 baker's notes: the recipe below uses strawberries, but feel free to use any type of berry you'd like. If you end up using blackberries, raspberries, or blueberries, you can keep them whole in the filling. the original recipe from deb of smitten kitchen includes a template on how to cut your dough so that the extra dough lays over the filling like a star. not sure if that made any sense. just check out the link below. make the dough: In a large bowl, whisk together the flour, salt, sugar, and lemon zest. With a pastry blender or your fingertips, mix the butter into the flour mixture until the butter pieces are the size of small peas. In a small bowl, stir together the greek yogurt and the 3 tablespoons of water. Pour the yogurt mixture into flour-butter mixture, and with a rubber spatula, stir together until the dough starts to come together. Use your hands to knead the dough into a rough, scrappy dough ball. Wrap the dough in plastic and flatten slightly into a disc. Chill the dough in the fridge for at least an hour, or in the freezer quickly for 20 minutes. make the filling: in a large bowl, stir together all the filling ingredients, and set it aside while you roll out the dough. assemble the galette: preheat the oven to 400 f.
On a well-floured worktop, roll out the dough into a large, round-ish (you can do it! ), about 14-inches across. make sure you're rolling out the dough and not stretching it to size, because it'll just shrink back in the oven. Transfer the rolled dough round onto a parchment-lined baking sheet. An easy way to do this is by folding the dough gently into quarters, trying not to crease the dough, and then unfolding it onto the lined baking pan. Or, you can roll it back up with the rolling pin and unroll it on the sheet. 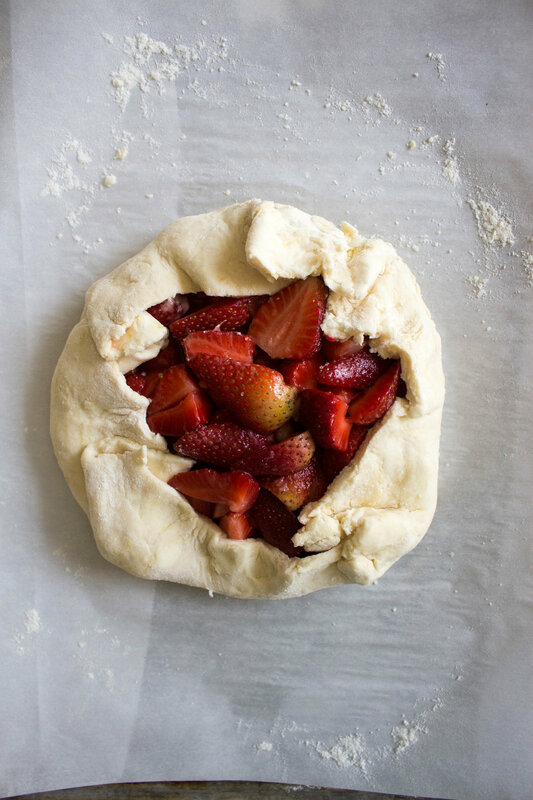 Spread the prepared strawberry filling in the center of the dough, leaving a two-inch border. Fold the border over the filling, pinching overlaps together. you can use the photos above as a reference. The messy look works here; it adds a rustic appearance to the galette. Whisk together the egg yolk and water in a small bowl. Brush the mixture over the exposed dough, and sprinkle with turbinado sugar. bake the galette: bake the galette for 30 minutes, until the crust is a golden brown. Let the galette cool for at least 5 minutes before serving as cut wedges. If serving warm, don't forget the vanilla ice cream.